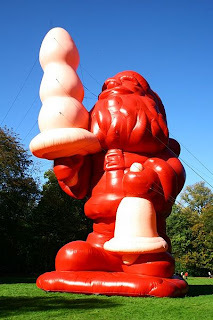 This exhibition brings together a group of new and rarely seen works by Paul McCarthy (b. 1945), one of the most influential American artists of his generation. The show focuses on a core strand of McCarthy's work: the use of architecture to create perceptual disorientation in the viewer through spinning mirrors, rotating walls, projections, and altered space. In Bang Bang Room (1992), the space almost seems to come alive as the walls of a free-standing domestic room move slowly in and out, the doors in each wall wildly slamming open and shut. In Spinning Room (2008), first conceived in 1971, but being realized for the first time for this show, live images of viewers are rotated and projected onto double-sided screens that appear infinitely reflected on four surrounding mirrored walls, enclosing the viewer in a wildly disorienting space. In Mad House (2008), being created for this show, a room spins disconcertingly on its axis. Two recently rediscovered films by McCarthy, one made in 1966 and one in 1971, reveal the artist's interest in perceptual puzzlement from the very beginning of his career.